1. 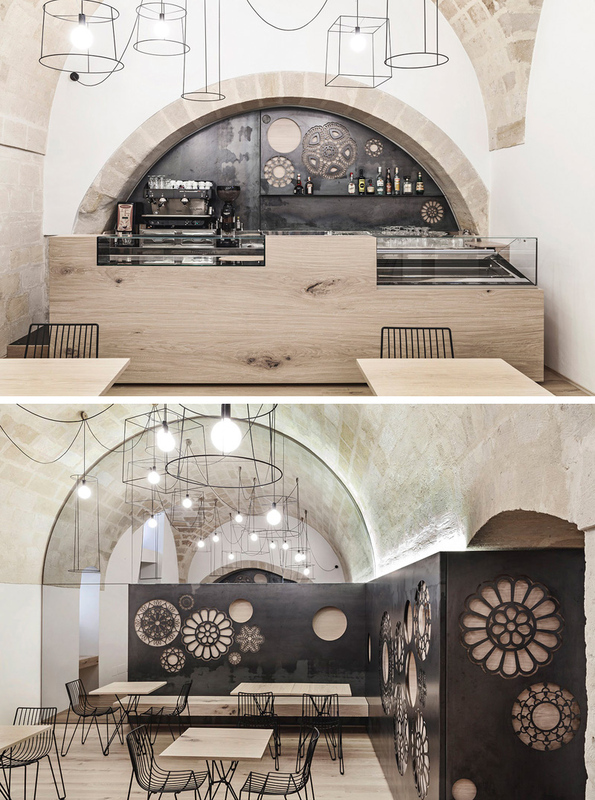 Mimosa Architekti and Modulora have designed Proti Proudu Bistro, a unique cafe in Prague. 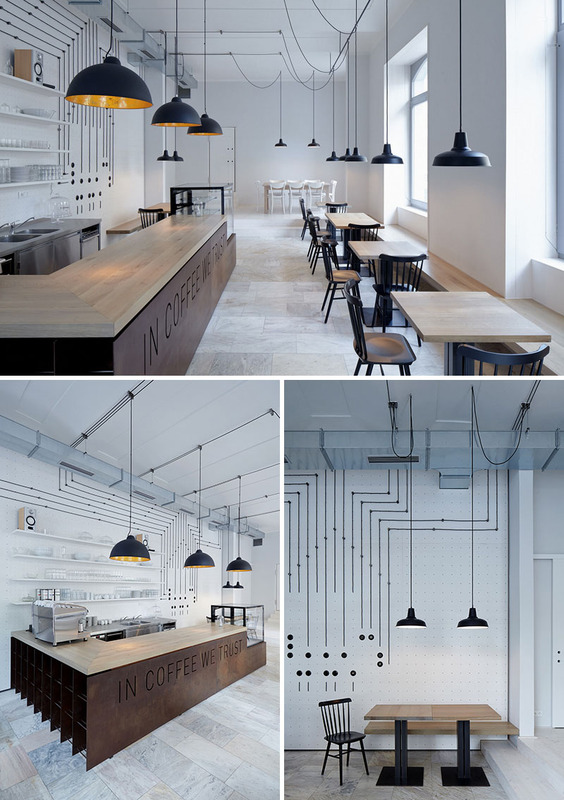 With white perforated plywood, a grid is created to connect the various components of the cafe, including the matte black pendant lights. See more photos, here. Design by Mimosa architekti and Modulora, with Lenka Pechanová. Photography & Concept by BoysPlayNice. 2. Ideograf – Paulina Czurak Design Studio designed C Corner Cafe, a bright, simple cafe in Gdynia, Poland that features a wall covered in 2740 white ceramic teacups. See more photos, here. 3. 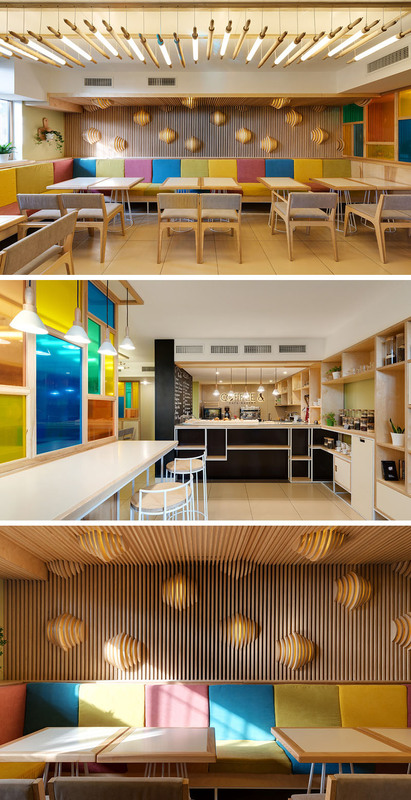 28 Form designed this cafe in Wroclaw, Poland that was created with kids and parents in mind. 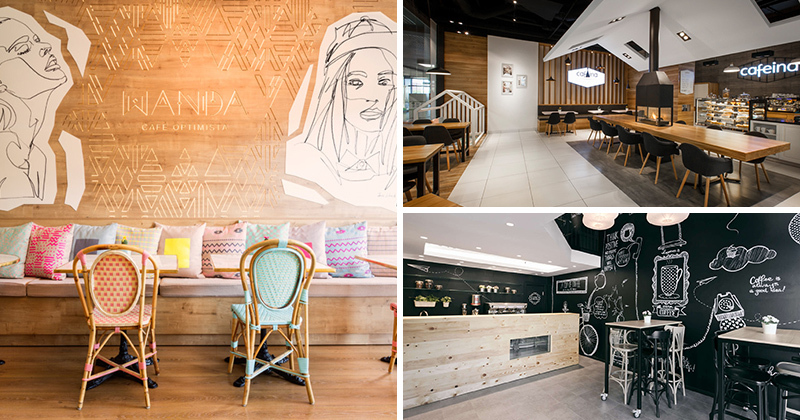 With chalkboard paint on a number of the walls, lights in various sizes and shapes, and an arts and crafts area, this coffee shop is the perfect place to spend a family afternoon. See more photos, here. 4. NORMLESS Architecture Studio designed Cups Nine, a cafe and patisserie in Trikala, Greece that features simple design, a unique hexagon to wood transition, and encourages people to use both the indoor and outdoor spaces of the cafe. See more photos, here. 5. 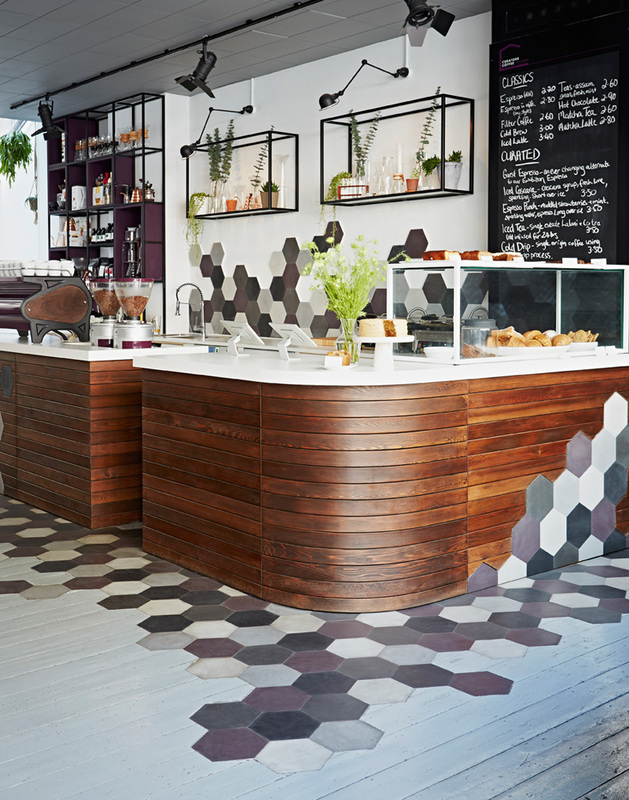 Ana Foster-Adams designed the interior of Curators Coffee Gallery, a coffee shop in London that uses hexagons, wood, and a sophisticated yet playful color palette to create a modern and inviting cafe. See more photos, here. 6. Deniz Kosan designed Walter’s Coffee Roastery, a cafe in Kadikoy, Istanbul inspired by the popular TV show, Breaking Bad. See more photos, here. 7. Manca Studio designed Caffè Ridola, a cafe in Materia, Italy that features minimalist design and steel panels on the walls with a variety of cut out motifs to create a modern look in the old building. See more photos, here. 8. Not a Number Architects designed Fudisiac, a juice bar and cafe in Bucharest, Romania with a simple wood, steel, and concrete interior that showcases their products and keeps the space bright and welcoming. See more photos, here. 9. Fruit Design designed Coffee Cake, a cafe in Nizniy Novgorod, Russia brimming with plant life and featuring a unique wood structure that houses their retail selection as well as cozy bench seating. See more photos, here. 10. 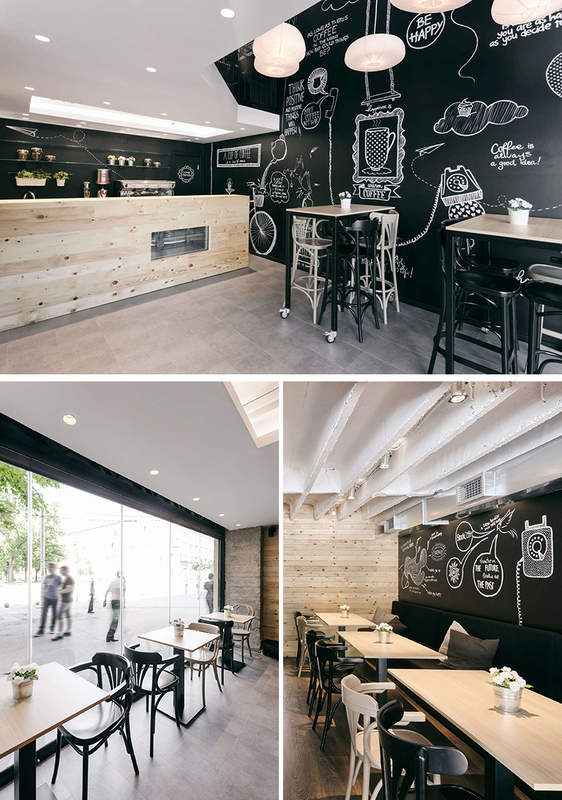 Arhitektura Budjevac designed Stock Coffee, a multilevel coffee shop in Niš, Serbia that features original hand-drawn illustrations and a simple palette that combines an industrial look with natural materials. See more photos, here. 11. YUDIN Design designed COFFEE &, a cafe and bakery in Kiev, Ukraine that has lights built into the walls designed to look like croissants. See more photos, here. 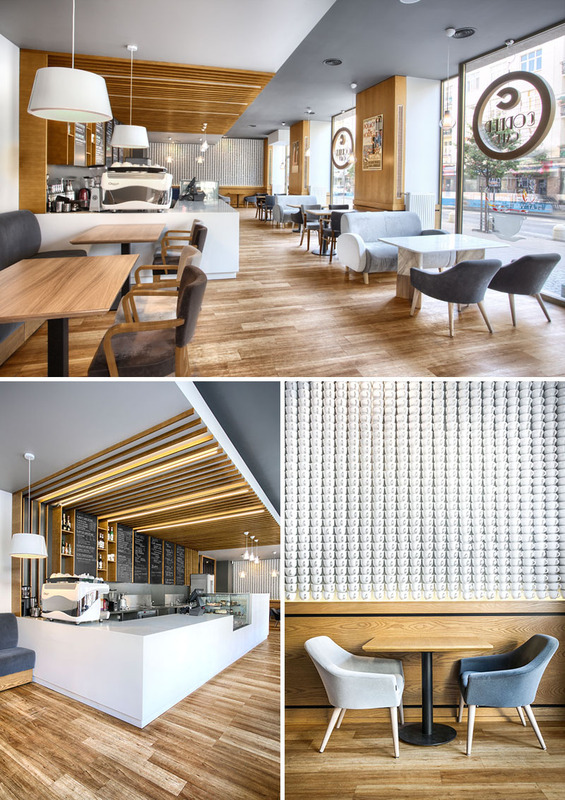 12. mode:lina architekci designed Cafeina Café in a mall in Skórzewo, Poland that has a modern style and a cozy feel thanks to the centrally located fireplace and comfortable seating. See more photos, here. 13. 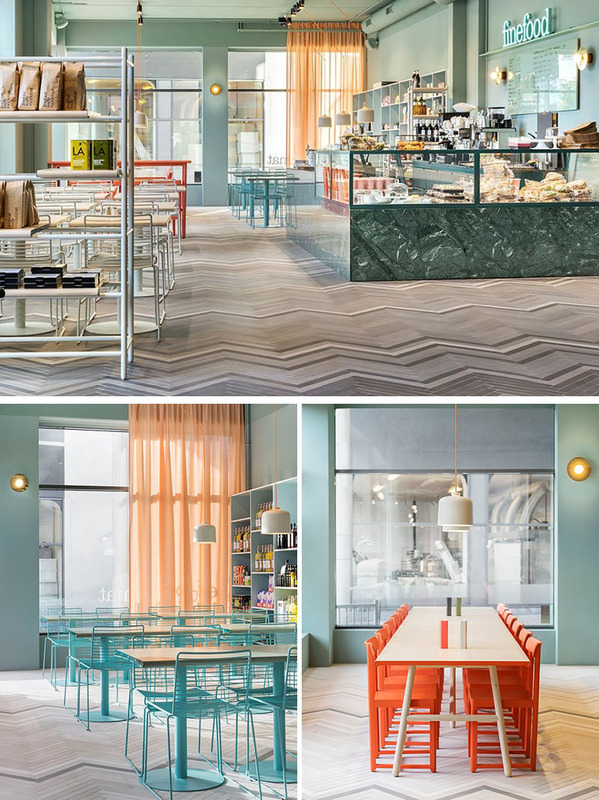 Parolio designed Wanda Cafe Optimista, a cafe in Madrid, Spain. In an attempt to create a place full of joy and positivity the cafe has a wide range of bright colors, unique art, and natural materials. See more photos, here. 14. Note Design Studio and Lerch worked together to create Finefood, a perfectly Scandinavian cafe and restaurant in Stockholm, Sweden that features soft colors, light ash wood, brass, and leather details. See more photos, here. Photography provided by Note Design Studio.